Shlomo Halberstam (1907 - August 2, 2000) (Hebrew: ר' שלמה הלברשטאם‎), was the third Rebbe of Bobov who re-established the Hasidic dynasty in the United States after World War II. 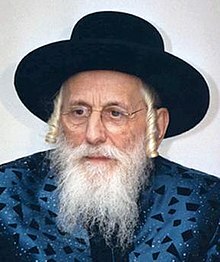 He was the oldest son of Rabbi Ben Zion Halberstam (1874–1941) of Bobov, who was murdered by the Nazis and their Ukrainian collaborators in the Holocaust. Both he and a son his successor Naftali survived and rebuilt in America. He also rebuilt in another way: he remarried, having lost his first wife and most of their children during the Holocaust. Rabbi Halberstam died in summer of 2000, and was succeeded by his oldest son, Rabbi Naftali Halberstam (1931–2005). A selection of his teachings were recorded in the book Kerem Shlome. Ben Zion Aryeh Leibish Halberstam, a son from the second wife, became Rebbe after Naftali. In 2016, the first addition of Divrei Shlomo, a new and revised selection of teachings was published by his son Ben Zion Aryeh Leibish Halberstam, the current Bobov Rebbe. ^ a b "The Life And Legacy Of Rabbi Shlomo Halberstam". August 1, 2008. This page was last edited on 7 March 2019, at 11:58 (UTC).